Samsung's newest offering in the Galaxy A-Series - Galaxy A20 is now available for sale in India. Announced last week in India, the affordable Galaxy A20 phone comes with Super AMOLED display, 3D glass design, ultra-wide camera, massive battery and much more. The new smartphone is positioned in between Galaxy A10 and Galaxy A30 in Samsung's popular Galaxy A-Series. Offered with 3D glass rear panel, the smartphone is available in three exciting colours - Black, Blue and Red. Priced at Rs 12,490 for 3GB and 32GB variant, the phone is available via Samsung e-Store and Samsung Opera House. Samsung Galaxy A90 Key Specifications Leaked Online Via Concept Video; To Get 48MP Pop-up Rotating Camera. 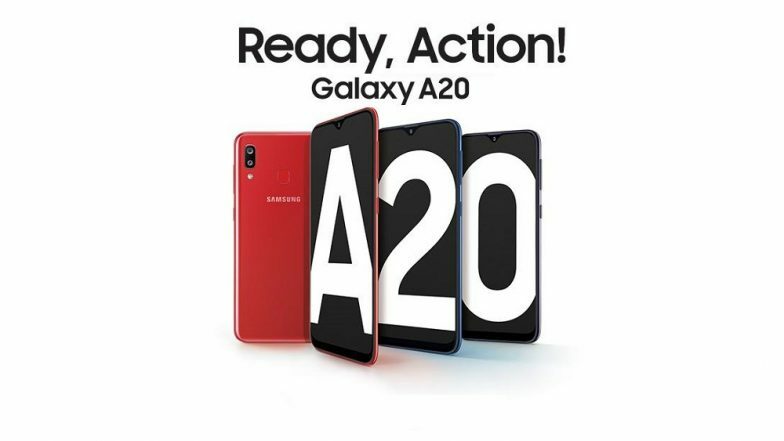 As far as the specifications are concerned, the new Galaxy A20 sport same features as that of Galaxy M20. It comes with a 6.4-inch Infinity-V Super AMOLED display with HD+ resolution of 1560x720 pixels. The phone too sports a waterdrop notch offering an immersive display experience like any other Samsung phones launched this year. Samsung Galaxy S10 5G Variant Launched in South Korea at $1,222. Under the hood, the phone comes with an in-house developed octa-core Exynos 7884 chipset which is the same that is seen on Galaxy A10. The chipset is clubbed with 3GB of RAM and 32GB internal memory which can be expanded up to 512GB via microSD card. Running Samsung's One UI based on Android Pie 9.0, the phone is backed by a massive 4000 mAh battery with 15W fast charging. For photography, there is a dual rear camera comprising of 13MP primary sensor with f/1.9 aperture and a 5MP ultra wide-angle sensor with f/2.2 aperture. The waterdrop notch upfront houses an 8MP camera for video calling and selfies.